Hi, will this fit plug n play on my Subaru wrx sti 2013? A: Yep, these will work great for your 13 STI. Will I need to purchase front and rear ss brake lines, or is it possible to only upgrade the front since they perform most of the braking? A: It is not required to upgrade the front/rear brake lines at the same time and we have seen many customer upgrade the front's only with no issues. A: It is not required to do the front and rear lines together, although for the most significant benefits, it's best to do both front and rear. Can you confirm that these fit the 2018 STi's with the new 6-pot Brembo's? A: This is not confirmed to fit a 2018 STI. 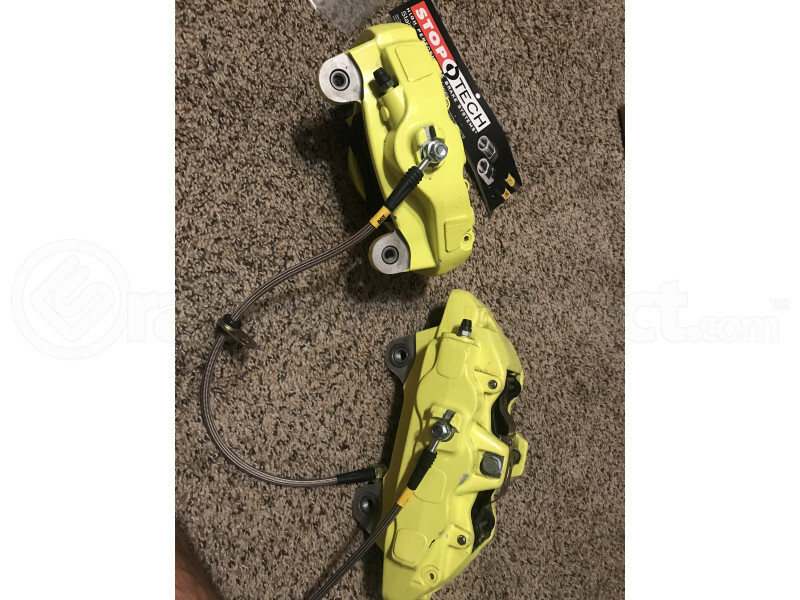 A: So I sourced some 2018 STI calipers (F & R) for my 2017 wrx and couldn’t find anywhere if these were confirmed to fit, I bit the bullet with the 20% off for the StopTech products and bought the front and rear that are listed for all WRX/STI years. They came in today and I tried them on the calipers which are off the car and he banjo bolts are a perfect fit. Wether the length is ok or not I’m not sure since I haven’t gotten all the parts for the swap yet but so far it’s looking good! Attached is a picture! Will this fit the 2011 Forester X/XT OEM front brakes? A: As of this time we can only confirm fitment for the WRX/STI models. how often would you replace these lines on a daily driver with some spirited driving and zero track use? A: In mild driving conditions you should not need to ever replace these brake lines. Are there stainless steel brake lines for the rear for an '09 impreza 2.5i,or just the front? A: Unfortunately at this time we do not have a confirmation that the brake calipers in the rear are the same as the 2.5GT or WRX. Stoptech does not have a confirmation on their website and I cannot guarantee that the 950.47507 fit. Hey guys, I'm looking at either these or the goodridge phantom series because I live in Mass and plan on keeping this car for as long as possible. Are these treated/coated on the outside to resist corrosion? A: The StopTech lines are coated. However be careful as some of the GoodRidge are not! I have a set of JDM 4pot calipers waiting to go on my '11 WRX- I figure I may as well throw new lines on there while I'm doing the swap, but will these lines work? The 4pots are the same as the red '06-'07 calipers the USDM WRX had, only the JDM units are black. A: We are unable to verify fitment as its not something we have tried. Subaru typically uses the same Caliper side banjo bolt, with the major difference being how the end of the line is bent to accommodate the caliper size and clearance for the line.